Do you have doubts about your ability to read and understand poems? Do you nonetheless long to have poetry be a part of your life? If so, Molly Peacock’s How to Read a Poem…and Start a Poetry Circle may be the reading companion you’ve been looking for. Part memoir, part reading guide, How to Read a Poem is a lyrical, personal exploration of the power and nuance of poetry. Peacock shares her own love of the art, describing how her favorite poems not only speak to her, but often speak for her, articulating aspects of her inner life that she herself had never found words for. This is true, she admits, even of poems she finds hard to fully comprehend. In other words, sometimes our bodies intuit the meaning and relevance of certain poems before our minds manage to decode them. To help readers in our own deciphering of poems, Peacock invites us to think about poetry as a fusion of music, storytelling, and painting, with the line forming the music, the sentence telling the story, and the image showing us the poet’s vision. Finally she offers an anthology of her talismans, with personal stories and startling insights to go with each poem. Thus, by reading Molly Peacock’s love treatise to poetry we become a part of her inner circle of poetry friends. 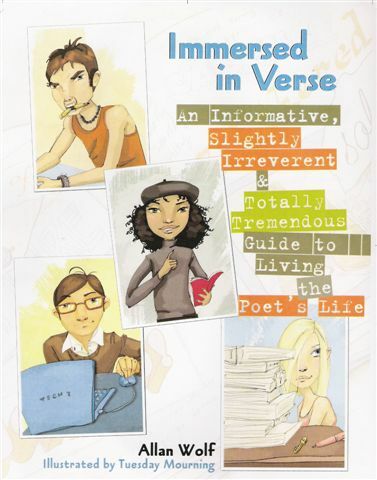 Immersed in Verse is a guide for teens interested in reading poetry, writing poetry and generally living like a poet. While the book’s style is playful and inviting, the advice within is serious and sound, making it a great introduction to poetry for beginning writers of any age. Wolf summons readers to “plunge into words”, to notice with all our senses how the world we live in touches and affects us. “Poems,” Wolf tells us, “are all around us waiting to be written.” He defines poetry as a communication of what’s inside us and invites readers to write about the things that catch our attention, burst into our minds, or live in our hearts. His enthusiasm for looking at the world as a poet does, fully awake, is inspiring and contagious. We learn the nine habits of highly successful poets, including doing more and watching less, writing every day, and being playful with words. Wolf also gives quick digestible lessons on metaphor, simile, personification, meter, rhythm, repetition and internal and external rhyme. He offers assignments and prompts to inspire writers and help us jumpstart their poems. Finally, Wolf provides tips for performing poetry, hosting a poetry bash, making our own poetry books and seeking publication. Immersed in Verse is a fun and thorough introduction not only to writing poetry but to choosing poetry as a way of life. Click on the picture of either book to reserve a copy for yourself!